This event happened in July of 93. I was in the Coast Guard, on a 378' in the South Pacific steaming toward Fiji one evening. The water was calm, very little wind, and there was enough light to clearly see the horizon. Nothing was happening on the ship, so a shipmate and I decided to wash some swabs (mops) off the rear of the ship. We were both qualified/certified watch-standers, I was 19 he was 20 and we were used to seeing things of all sorts at sea. Well, Swab cleaning involved tying the handle of a mop to a line and dragging it behind the ship for a few miles. I was watching the mop dragging behind the ship while my buddy was having a cigarette and suddenly the water, turned a neon green color, just behind the rear of the ship. To our amazement a ball the size of a basketball popped up out of the water, and stopped eye level about 10 feet from my face. I was stunned, and fixed on the object due to its bright green color. I did notice that when it exited the water, the water returned to its original color, and did not appear to reflect its light even though the light was intense. 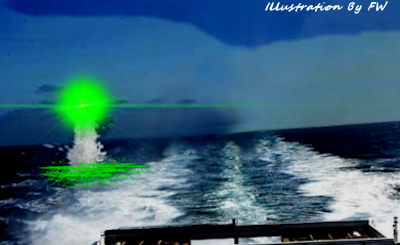 I vividly remembering seeing the neon green water streaming off the object as it hovered, then just as suddenly it took off on a 45degree angle from the rear of the ship and disappeared from view. I recall hearing a sound as it took off, it sounded like a toy air cannon, nothing more. Even stranger for me, is that when the object left, I looked back at my buddy and he was gone. I looked for him on the ship, and found him in his berthing area. I asked him if he saw what I saw, and he said he ran, and that he didn't see anything and I didn't see anything. Coincidentally, one week earlier a good friend of mine in the Radio room was flown off the ship for "seeing things", so we kept our mouths shut. I found it odd that I forgot the event for many years until I heard a similar story on the news regarding green glowing balls of light. This is the first time I have ever wrote this story down, so there it is. very strange that these things are handled like that.